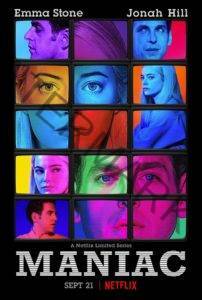 Set in a world somewhat like our world, in a time quite similar to our time, Maniac tells the stories of Annie Landsberg (Emma Stone) and Owen Milgrim (Jonah Hill), two strangers drawn to the late stages of a mysterious pharmaceutical trial, each for their own reasons. Annie’s disaffected and aimless, fixated on broken relationships with her mother and her sister; Owen, the fifth son of wealthy New York industrialists, has struggled his whole life with a disputed diagnosis of schizophrenia. Neither of their lives have turned out quite right, and the promise of a new, radical kind of pharmaceutical treatment—a sequence of pills its inventor, Dr. James K. Mantleray (Justin Theroux), claims can repair anything about the mind, be it mental illness or heartbreak—draws them and ten other strangers to the facilities of Neberdine Pharmaceutical and Biotech for a three-day drug trial that will, they’re assured, with no complications or side-effects whatsoever, solve all of their problems, permanently. Things do not go as planned.Maniac is created by Patrick Somerville, and directed by Cary Joji Fukunaga. If you like what read about Maniac, please remember to share Netflix New Releases on Facebook, Twitter or wherever you guys want it’s all appreciated.